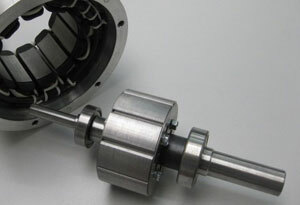 The rotor or armature is the moving part of the electromagnetic circuit that carries the continuous armature winding, which is composed of a series of coils connected through the commutator. The rotor and winding rotate within the field winding’s magnetic field, such that the opposing stator’s field causes the rotor to move away, producing torque. A commutator, or metal ring divided into separate halves, may also reverse the coil’s electric current each half turn. Induction motors rely upon a squirrel cage, which is made up of evenly-spaced bars around a laminated steel core, or wound rotors, which entail a cylindrical, laminated core with winding slots.